What's for lunch?, well, if you're lucky it's one of Japan's DHC Bentos, or, lunchboxes. Containing four essentials, this box packs in a little of everything to care for the skin. The Japanese believe in double cleansing, the first to remove the majority of makeup from the day and the second to give a final clean and dislodge finer impurities. The box contains the fantastic DHC Cleansing Oil in the most travel-friendly bottle, this rosemary and olive oil blend lifts all makeup on the first cleanse, a rich and substantial oil. A mild soap is provided for the second cleanse, often it is preferred to have a product that lathers, for me I prefer not to use anything that excessively lathers, but, it is a personal choice. I do like specific eye masks, it's an area of my face that I actually prefer to use a sheet textured mask and these are perfect. They fit on the lower eye area, delivering ingredients right to the area of concern. Ideal to leave on overnight if required, great to apply during a flight or you can give your eye area a 20 - 30-minute treat. There is something rather 'proper' about blotting papers, no massive powder compact followed by a dubious looking grubby powder puff or brush that has its bristles bent in all directions (just me then). Blotting papers keep skin shine free, for me, in a subtle manner and I do need a powder for full taking down of shine, but, these delicate hemp fibre sheets are lovely to just dull the shine without disturbing my makeup. 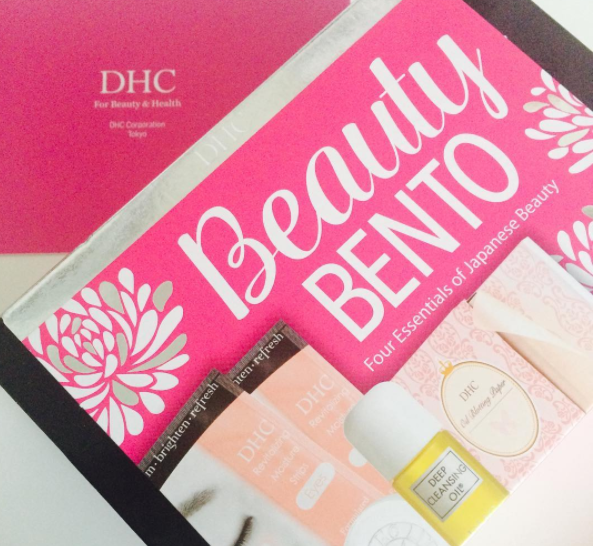 This well stocked DHC box is inspired by the 'lunchboxes' available throughout Japan, sold at train stations etc, which offer the buyer products that follow the skincare rituals of its Japanese heritage.